In Brazil about 154 million people speak the Portuguese language and is the native language for almost 170 million people who live in Portugal and the surrounding Islands. There are also over 4 million people in Africa who speak Portuguese. In the United States it is estimated that over half a million people also speak this language. Translate Portuguese Documents Instantly with Automatic Software! With a Portuguese translation software program you can convert Portuguese to English and English to Portuguese. You can communicate by using your computer to translate documents. Write a letter, email or any document and instantly convert it to another language. Powerful software can convert letters, email, PDF files, Microsoft Word, Microsoft Power Point, and Microsoft Excel files easily. Translate in seconds, open your document in your favorite Microsoft Office application with our more professional package, click translate and instantly the document translates into Portuguese or English. Save the document's formatting! Features vary depending upon the product you purchase. Systran Translation Software has powerful English to Portuguese conversion (and Portuguese to English) capabilities which hold the original document's layout, font styles, tables, text highlighting, and graphics. 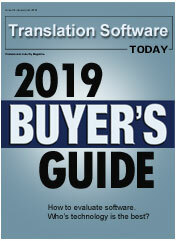 For a complete look at our products and how they can help you with your translation needs visit our Portuguese Translation Software page. It helps to learn more about the language you are translating. Below are a few important items that can help when working with the Portuguese language. Portuguese spoken in Portugal differs to some extent from the Portuguese currently spoken in Brazil, with reference to pronunciation, grammar, and vocabulary, the differences are not major. With our translation software you can select the dialect, therefore the software will handle translating both dialects. Visit our Learning center for more information on Portuguese dialects. The spoken Portuguese language uses the nasalization of certain vowels and diphthongs, which can be indicated by a tilde (~) placed above the appropriate vowel. The acute (´) and circumflex (^) accents serve to make clear both stress and pronunciation and also to distinguish homonyms (for example, e "and," but é "is" ). The grave accent (`) is a guide to pronunciation. It can also indicate a contraction, as in às, which is a combination of a "to" and as "the" (feminine plural). A c with a cedilla ( ç ) is pronounced like c in English place when used before the vowels a, o, and u. In Spanish, there are two forms of the verb "to be" : ser, which denotes a comparatively permanent state and which also precedes a predicate noun, and estar, which denotes a comparatively temporary condition. Again like Spanish, Portuguese tends to use reflexive verbs instead of the passive voice. If you are learning Portuguese, using translation software can definitely help. You can improve your grammar and conversational skills as you begin to speak Portuguese. With our Portuguese language programs, you'll quickly be able to speak Portuguese, learn Portuguese vocabulary, conjugate Portuguese verbs, understand Portuguese grammar, and master the language as you translate Portuguese to English and translate English to Portuguese. 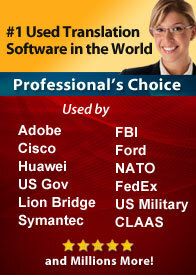 Many travelers purchase software when going to a foreign country for business or pleasure. Having a translator can make the trip more pleasurable. Install the software on your laptop and you can communicate more effectively. Visit our Online Learning Center for more information and tips on translating Portuguese. You will find tools, buying guides, information, how to videos and more on many languages. Find additional information for Spanish, French, German, Italian, Swedish, Polish, Dutch, Korean, Japanese, Chinese and Arabic!